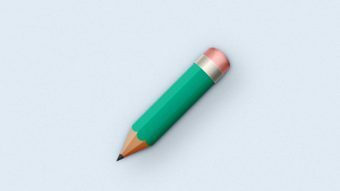 In the following tutorial you will learn how to create a simple pencil icon in Adobe Photoshop. Open Photoshop and hit Control + N to create a new document. Enter all the data shown in the following image and click OK. Enable the Grid (View > Show > Grid) and the Snap to Grid (View > Snap To > Grid). For starters you will need a grid every 5px, so go to Edit > Preferences > Guides, Grid & Slices and focus on the Grid section. Enter 5 in the Gridline Every box and 1 in the Subdivision box. Also, set the color of the grid to #a7a7a7. Once you have set all these properties click OK. Try not to get discouraged by all that grid, it will ease your work later and keep in mind that you can easily enable or disable it using the Control + “ keyboard shortcut. You should also open the Info panel (Window > Info) for a live preview with the size and position of your shapes. Set the foreground color at #dcb99b, pick the Rectangle Tool and create a 15 x 65px shape. Focus on the bottom side of this rectangle, pick the Pen Tool and simply click on the left anchor point to remove it. Keep focusing on the bottom side of your vector shape, pick the Direct Selection Tool, select the remaining anchor point and drag it 10px to the right as shown in the third image. Set the foreground color to #ce9367, pick the Rectangle Tool, create a 20 x 65px shape and place it as shown in the first image. Focus on the bottom side of this new rectangle and remove the left anchor point using the Pen Tool. Keep focusing on the bottom side of your vector shape, switch to the Direct Selection Tool, select the remaining anchor point and drag it 10px to the left as shown in the third image. Set the foreground color to #b56230, pick the Rectangle Tool, create another 15 x 65px shape and place it as shown in the first image. Focus on the bottom side of this new rectangle and remove the right anchor point using the Pen Tool. Keep focusing on the bottom side of your vector shape, switch to the Direct Selection Tool, select the remaining anchor point and drag it 10px to the left as shown in the third image. Set the foreground color to #ffca5a, pick the Rectangle Tool, create a 15 x 160px shape and place it as shown in the first image. Make sure that this yellow rectangle stays selected and go to Edit > Transform > Warp. Select Arc Lower from the Warp drop-down menu, enter 75 in the Bend box and hit Enter. In the end things should look like in the second image. Focus on the Layers panel (Window > Layers) and simply double click on your yellow vector shape to open the Layer Style window. Activate the Gradient Overlay and enter the attributes shown in the following image. Set the foreground color to #ff8c15, pick the Rectangle Tool, create a 20 x 160px shape and place it as shown in the first image. Make sure that this orange rectangle stays selected and go to Edit > Transform > Warp. Select Arc Lower from the Warp drop-down menu, enter 100 in the Bend box and hit Enter. In the end things should look like in the second image. Open the Layer Style window for your orange vector shape and enter the attributes shown in the following images. Set the foreground color to #c42915, pick the Rectangle Tool, create a 15 x 160px shape and place it as shown in the first image. Make sure that this red rectangle stays selected and go to Edit > Transform > Warp. Select Arc Lower from the Warp drop-down menu, enter 75 in the Bend box and hit Enter. In the end things should look like in the second image. Open the Layer Style window for your red vector shape and enter the attributes shown in the following images. Set the foreground color to #3b3c40, pick the Rectangle Tool, create a 50 x 65px shape and place it as shown in the first image. Focus on the bottom side of this new rectangle and remove the right anchor point using the Pen Tool. Keep focusing on the bottom side of your vector shape, switch to the Direct Selection Tool, select the remaining anchor point and drag it 25px to the right as shown in the third image. Make sure that your dark rectangle is still selected and grab the Ellipse Tool. Hold the Alt button on your keyboard and draw a 20px circle as shown in the first image. Open the Layer Style window for this vector shape and enter the attributes shown in the following images. Set the foreground color to #fa6580, pick the Rounded Rectangle Tool, focus on the control panel and set the Radius to 5px. Return to your canvas, create a 50 x 30px shape and place it as shown in the first image. Make sure that your pink, rounded rectangle stays selected and go to Edit > Transform > Warp. Select Arc Lower from the Warp drop-down menu, enter -60 in the Bend box and hit Enter. In the end things should look like in the second image. Open the Layer Style window for this pink vector shape and enter the attributes shown in the following image. Set the foreground color to #dfdfe1, pick the Rectangle Tool, create a 50 x 20px shape and place it as shown in the following image. For the following steps you will need a grid every 1px, so go to to Edit > Preferences > Guides, Grid & Slices and enter 1 in the Gridline Every box. Focus on your grey rectangle and pick the Direct Selection Tool. Select the left anchor points and drag them 1px to the left then select the right anchor points and drag them 1px to the right. The Snap to Grid feature will ease your work and in the end things should look like in the second image. Make sure that your grey vector shape stays selected and pick the Ellipse Tool. Hold the Alt button from your keyboard and draw a 52 x 4px shape as shown in the first image. Focus on the top side of your grey shape, hold the Shift button on your keyboard and draw a 52 x 8px shape as shown in the second image. Open the Layers Style window for your grey vector shape and enter the attributes shown in the following images. Make sure that your grey vector shape is still selected and hit Control + J to duplicate it. Focus on the Layers panel, right click on your fresh copy and go to Clear Layer Style. Open the Layer Style window for this copy, lower its Fill to 0% then enter the attributes shown in the following images. Set the foreground color to black, pick the Ellipse Tool, create a 52 x 4px shape and place it as shown in the first image. Make sure that this thin, black shape is selected and hit Shift + Control + [ to send it to back. Focus on the Layers panel and reselect all the shapes that make up your pencil. Right click on one of these selections and go to Convert to Smart Object. Make sure that this smart object is selected and hit Control + T. Rotate it 45 degrees (as shown in the second image) and hit Enter. Open the Layer Style window for your smart object and enter the attributes shown in the following images. Duplicate your smart object (Control + J), select the copy and get rid of the existing Layer Style attributes using that same Clear Layer Style option. Open the Layer Style window for this fresh copy, activate the Color Overlay and enter the attributes shown in the following image. Focus on the Layers panel, right click on the smart object made in the previous step and go again to Convert to Smart Object. Make sure that your newly created smart object stays selected, move it 15px down and 15px to the right, lower the Opacity to 30% and send it to back (Shift + Control + [ ). Make sure that your black smart object is still selected and go to Filter > Blur > Gaussian Blur. Set the Radius at 20px, click OK and go to Filter > Blur > Motion Blur. Set the Angle at -45 degrees, drag the slider to 50px and click OK.
Hit Shift + Control + Alt + N to create a new layer, select it and send it to back (Shift + Control + [ ). Make sure that this new layer stays selected, pick the Paint Bucket Tool, set the foreground color to #e1ebf5 and click inside your canvas. Finally, go to Filter > Noise > Add Noise. Enter the attributes shown in the following image and click OK.